S Paul loved his fellow Jews, his 'kinsmen' and believed "the gifts and call of God are irrevocable". He believed that at the End, those among them who had rejected Christ would be brought in to the chosen people. He believed that they were like olive branches which had been cut off so that the Gentiles, wild olive branches, could be grafted in. But, when the fulness of the Gentiles had entered in, Jealousy would strike the unbelieving Jews, and they too would enter in; the severed branches would be grafted back. In all this, we have to be careful to make clear that we are - or rather, S Paul is - talking about those Jews who have rejected their Messiah. Not all Jews. Just as so often in the OLd Testament, there is a faithful remnant, mentioned by S Paul (indeed, it included him, the other Apostles, and the Jerusalem Church): those Jews who have shown faith and obedience. So, at this stage, the Church, God's Chosen People, the True Israel, consists of a combination of the faithful, remnant, Jews, and of Gentile converts. At the End, the complete parallelism between the Jews and the Gentiles will be manifest. All have disobeyed, so that all may receive mercy. There is no suggestion in Romans that the unbelieving Jews will 'enter in' in any other way than the Gentiles and the 'faithful remnant' Jews have entered in: by faith and obedience in Jesus Christ. S Paul's whole logic is subverted if we assume that, all along, he is keeping hidden up his sleeve the somewhat relevant fact that the Jews do not, after all, need through Faith the saving grace of our Lord Jesus Christ at all. If that had been true, why did S Paul bother trying to convert them? Why did he become all things to all men, now behaving like a Jew and now living the Gentile life, if 'saving' some Jews matters not at all because they will in any case enter in on the grounds of what they already had before the Incarnation, Crucifixion, and Resurrection? Why, throughout Acts, do we find him enduring every hardship, every tribulation, in his attempt to convert Jews ... as well as Gentiles? 'Ed' Sanders, who initiated the 'new look' in Pauline studies back in the eighties, was a liberal who thought that the whole Pauline construct of Judaism ultimately entering in by faith in Jesus Christ was insupportable in a modern context. But he was compelled to admit that this is what S Paul did mean. The teaching of S Paul is not, as the media cheerfully and repeatedly inform us, something peculiar to unreconstructed, 'extreme' Catholics. The doctrinal standard of the Church of England set by Parliamentary statute is still the Book of Common Prayer. (Although alternatives are now legally available for use, and [like the Novus Ordo in the Catholic Church] are used in the overwhelming majority of congregations, they do not enjoy the same entrenched status as the Prayer Book.) The Prince of Wales, incidentally, is Patron of a Society which campaigns for its continued use in church. And the Prayer Book, on Good Friday, asks God to "Have mercy upon all Jews ... and [to] take from them all ignorance, hardness of heart, and contempt of [his] Word: and so [to] fetch them home ... to [his] flock, that they may be saved among the remnant of the true Israelites, and be made one fold under one shepherd, Jesus Christ ... ". I wonder why nobody bothers to make a fuss about this? Why don't Vincent Nichols and his associates demand that Parliament change this 'offensive' text? Why don't they get excited about the Byzantine texts for Good Friday? They seem, strangely, to have chip on their shoulders about either the Extraordinary Form; or Pope Benedict XVI; or both. "13 But now in Christ Jesus, you, who some time were afar off, are made near by the blood of Christ. 16 And might reconcile both to God in one body by the cross, killing the enmities in himself." If Christ reconciled gentile and Jew in the New Covenant by abolishing the Mosaic Law and precepts, making of them one people of God, then those who maintain the continuing validity of the Mosaic Covenant (the dual covenant theorists) directly contradict Holy Writ. Not only do they deny the efficacy of the work Christ did on the Cross, they are asserting two parallel economies of salvation which has no basis in Scripture whatsoever. 8,7 "For if the former had been faultless, there should not indeed a place have been sought for a second. 9 Not according to the testament which I made with their fathers, on the day when I took them by the hand to lead them out of the land of Egypt: for they continued not in my testament: and I regarded them not, saith the Lord." 8,13 "Now in saying a new, he hath made the former old. And that which decayeth and groweth old, is near its end." 10,9 "Then said I: Behold, I come to do thy will, O God: he taketh away the first, that he may establish the second." Scripture, Tradition and the Magisterium testified with one voice up until the 1960's that the New superceded and replaced the Old. There is nothing in NA which contradicts this. Cardinal Kasper certainly used to be a fan of the dual covenant theory and he acknowledged that it contradicted Hebrews. His only response to this seemed to imply that we should simply disregard it along with Ephesians and all the Johanine writings which assert that "He who has not the Son, neither has he the Father." 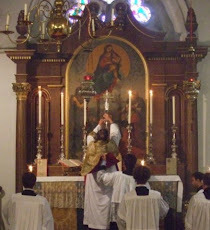 It is common for men to claim that soi disant traditionalists are anti-semitic but is there a traditionalist worthy of the name who does not own or has not read deeply of the great Dom Prosper Gueranger? HIs Liturgical Year describes Pentecost as The Jewish Pentecost. Dear Father. I love you point about the new Israel and as it is the case we are members of a new nation, I consider my nation's Capital to be Rome, not Washington D.C.
"Dear Father. I love you point about the new Israel and as it is the case we are members of a new nation, I consider my nation's Capital to be Rome, not Washington D.C."
Very well said; I have thought the same for decades. "The old debate as to whether Paul was opposing Judaism per se or a form of Jewish Christianity akin to that of the Galatian "agitators" is, I think, skewed in recent discussion by the anxious attempt to protect Paul from saying anything apparently derogatory about Jews, and the balancing attempt in some quarters to have him say as many snide things as possible about some of his fellow-Christians. These contemporary concerns have often obscured the underlying thrust, which is both subtle in itself and fascinating when we come to apply it to the wider polemic which, I am suggesting, the chapter is offering." "The first two of these epithets [βλεπετε τους κυνας. βλεπετε τους κακους εργατας. Beware the dogs ... the evil doers!] could have applied to pagans, of course, not least Cynics, as some have suggested, but the third [βλεπετε την κατατομην i.e., Beware the mutilation! ], though clearly a pagan term, by generating the counter-assertion of verse 3, shows that it is Jews who are in mind. Yes, but Jews seen now as a form of paganism. The shock which greets such an announcement in our contemporary world should be blunted by two compelling factors. First, this is by no means the only time where Paul makes exactly this move. In Galatians 4.1-11, in line with the letter as a whole, he warns the young church that if they submit to circumcision they will not only not escape finally from the paganism they have rejected in becoming Christians, but will actually be returning to it in a subtler form. They will be returning to the realm of the flesh, of the principalities and powers." What I'm suggesting by quoting Wright here is that real scholarship--that of Sanders and Davies as well as of Wright--is able to critically deal with Paul: the real Paul. And the real Paul has a subtle analysis of Christian faith on offer to both Jews and Gentiles that would do credit to modern scholars of comparative religion. Those who are attacking the traditional liturgy are in fact offering unscholarly, ideologically influenced pseudo critiques that are unworthy of the modern Church. They're an embarrassment. Well said, if this separated brother involved in official dialogues with the RCC may chime in. Ecumenism is surely pointless if we may cavalierly brush aside the inspired texts of Sacred Scripture. Moreover, the One before whom every knee shall bow is not an optional extra. Who is entitled to use the Pope Francis Missal? Our Lady; the Moslems; and a great Patriarch.